For other uses, see Khabarovsk (disambiguation). 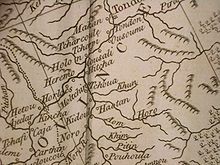 Native villages near the site of the future Khabarovsk according to an English map of 1773. The village closest to today's Khabarovsk is labeled "Hitcha". Maack's "Cape Kyrma" site (thought by B.P. Polyakov to be the site of Stepanov's Kosogorsky Ostrog) is "Heremo"
Khabarovsk (Russian: Хаба́ровск, tr. Khabarovsk, IPA: [xɐˈbarəfsk] ( listen)) is the largest city and the administrative center of Khabarovsk Krai, Russia, located 30 kilometers (19 mi) from the Chinese border, at the confluence of the Amur and Ussuri Rivers, about 800 kilometers (500 mi) north of Vladivostok. The city was the administrative center of the Far Eastern Federal District of Russia from 2002 until December 2018, when Vladivostok took over that role. It is the second largest city in the Russian Far East, after Vladivostok. As of the 2010 Census, its population was 577,441. It was previously known as Khabarovka (until 1893). Khabarovsk is the closest major city to Birobidzhan, which is a town and the administrative center of the Jewish Autonomous Oblast. In the mid-17th century, the Amur Valley became the scene of hostilities between the Russian Cossacks, trying to expand into the region and to collect tribute from the natives, and the rising Manchu Qing Dynasty, intent on securing the region for itself. Monument to Yerofey Khabarov in Khabarovsk. The Russian explorers and raiders of the 1650s set up a number of more or less fortified camps (ostrogs) on the Amur; most of them were in use for only a few months, and later destroyed. It is usually thought that the first such camp in the general area of today's Khabarovsk was the fortified winter camp named Achansk (Ачанск) or Achansky gorodok (Ачанский городок), built by the Cossacks of Yerofey Khabarov in September 1651 after they had sailed to the area from the upper Amur. The fort was named after the local tribe whom Khabarov's people called "Achans". Already on October 8 the fort was unsuccessfully attacked by joint forces of Achans and Duchers (who had good reasons to hate the Cossacks, due to their rather heavy-handed tribute-extraction tactics), while many Russians were away fishing. In late November, Khabarov's people undertook a three-day campaign against the local chief Zhakshur (Жакшур) (whose name is also known in a more Russian version, Zaksor (Заксор)), collecting a large amount of tribute and announcing that the locals were now subjects of the Russian Czar. Similar campaign was waged later in winter against the Ducher chief Nechiga (Нечига), farther away from Achansk. On March 24 (or 26), 1652, Fort Achansk was attacked by Manchu cavalry, led by Ninguta's commander Haise, reinforced by Ducher auxiliaries, but the Cossacks stood their ground in a day-long battle and even managed to seize the attackers' supply train. Once the ice on the Amur broke in the spring of 1652, Khabarov's people destroyed their fort and sailed away. The exact location of Khabarov's Achansk has long been a subject for the debate among Russian historians and geographers. A number of locations, both upstream and downstream of today's Khabarovsk, have been proposed since Richard Maack, one of the first Russian scholars to visit the region, identified Achansk in 1859 with the ruins on Cape Kyrma, which is located on the southern (Chinese) shore of the Amur, upstream of Khabarovsk. The most widely accepted point of view is probably that of Boris Polevoy, who believed that Khabarov's Achansk was located in the Nanai village later known as Odzhal-Bolon (Russian: Оджал-Болонь), located on the left bank of the Amur, closer to Amursk than to Khabarovsk. 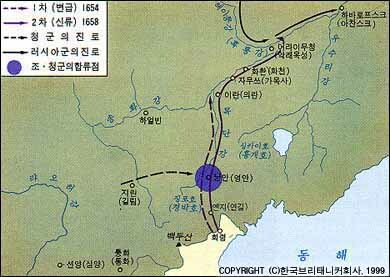 One of his arguments was that both Khabarov's Achan (sometimes also spelled by the explorer as Otshchan, Отщан), and Wuzhala (乌扎拉) of the Chinese records of the 1652 engagement are based on the name of the Nanai clan "Odzhal" (Оджал), corresponding to the 20th-century name of the village as well. (The name of the clan was also written as "Uzala", as in the name of its best-known member, Dersu Uzala). Polevoy's view appeared to gain wide support among the Russian geographer community; petitioned by the Amur Branch of the Russian Geographical Society, the Russian Government renamed the village of Odzhal to Achan in 1977, to celebrate its connection with Khabarov's raid. As to the Cape Kyrma ruins, thought by Maack to be the remains of Achansk, B.P. Polevoy identified them as the remains of another ostrog - namely, Kosogorsky Ostrog, where Onufriy Stepanov stayed a few years later. After the Treaty of Nerchinsk (1689), the area became an uncontested part of the Qing Empire for the next century and a half. Modern historical maps of the Qing period published in China mark the site of future Khabarovsk as Bólì (Chinese: 伯力). All of the middle and lower Amur region was nominally part of the Jilin Province, run first out of Ninguta and later out of Jilin City. French Jesuits who sailed along the Ussury and the Amur in 1709 prepared the first more or less precise map of the region. According to them, the indigenous Nanai people were living on the Ussury and on the Amur down to the mouth of the Dondon River (i.e., in the region including the site of the future Khabarovsk). These people were known to the Chinese as Yupi Dazi ("Fish skin Tartars"). In 1858, the area was ceded to Russia under the Treaty of Aigun. The Russians founded the military outpost of Khabarovka (Хаба́ровка), named after Yerofey Khabarov. The post later became an important industrial center for the region. Town status was granted in 1880; in 1893, it was given its present name. In 1894, a department of Russian Geographical Society was formed in Khabarovsk and to found libraries, theatres and museums in the city. Since then, Khabarovsk's cultural life has flourished. Much of the local indigenous history has been well preserved in the Regional Lore Museum and Natural History Museum and in places like near the Nanai settlement of Sikachi-Alyan, where cliff drawings from more than 13,000 years ago can be found. The Khabarovsk Art Museum exhibits a rare collection of old Russian icons. In 1916, the Khabarovsk Bridge across the Amur was completed, allowing Trans-Siberian trains to cross the river without using ferries (or temporary rail tracks over the frozen river in winter). After the defeat of Japan in World War II, Khabarovsk was the site of the Khabarovsk War Crime Trials, in which twelve former members of the Japanese Kwantung Army and Unit 731 were put on trial for the manufacture and use of biological weapons during World War II. Chinese Emperor Puyi, captured by Soviet troops in Manchuria, was relocated to Khabarovsk and lived there from 1945 up to 1950, when he was returned to China. When Japan fell in September 1945 the United States reached an agreement with Stalin to build two U.S. Naval Advance Bases (Fleet Weather Centrals) in the USSR. The U.S built one 10 miles outside Petropavlovsk-Kamchatsky on the Kamchatka Peninsula with the code name TAMA. The other was 20 miles outside Khabarovsk in buildings provided by the Soviets, code-named MOKO. For mail Khabarovsk was assigned U.S.Navy number 1168, FPO San Francisco. The American use of these two bases was short-lived. On 5 November 1956, the first phase of the city tram was commissioned. The Khabarovsk television studio began broadcasting in 1960. On 1 September 1967, the Khabarovsk Institute of Physical Education, now the Far Eastern State Academy of Physical Culture, opened. On 14 January 1971 Khabarovsk was awarded the Order of October Revolution. In 1975 the first stage of the urban trolley opened. In 1976 the city hosted an international ice hockey tournament with the ball for the prize of the newspaper Sovietskaya Rossia. In 1981 the Bandy World Championship was played in the city. In 1996, Khabarovsk held its first mayoral elections. Paul D. Filippov, whose candidacy was supported by Governor Viktor Ishayev, was defeated. In 1998, reconstruction of the central square of Khabarovsk was completed. In May 2000, President of Russia, Vladimir Putin, decreed that new federal districts be formed, and Khabarovsk became the center of the Far Eastern Federal District. In 2006, the Center for Cardiovascular Surgery, a high-tech medical center, was constructed according to a Russian national health project. In 2008, the train station was completely renovated, and the adjacent square was reconstructed to include fountains and an underground passage. In 2009, Khabarovsk hosted the EU-Russia summit. In 2010, the city hosted a meeting of the Great Circle of Ussuri Cossacks. On 3 November 2012, Khabarovsk was awarded the honorary title of "City of Military Glory". Khabarovsk is the administrative center of the krai and, within the framework of administrative divisions, it also serves as the administrative center of Khabarovsky District, even though it is not a part of it. As an administrative division, it is incorporated separately as the city of krai significance of Khabarovsk—an administrative unit with the status equal to that of the districts. As a municipal division, the city of krai significance of Khabarovsk is incorporated as Khabarovsk Urban Okrug. Khabarovsk experiences a monsoonal dry-winter humid continental climate (Köppen climate classification Dwb). The average annual precipitation is 682 millimeters (26.9 in), mainly concentrated in the summer. In a few years, November to March hardly receive any precipitation. The driest year was 2001 with only 381 millimeters (15.0 in) of precipitation and the wettest was 1981 when 1,105 millimeters (43.5 in) of precipitation fell. The wettest month was August 1981 with a total precipitation of 434 millimeters (17.1 in). Snowfall is common, though light, with an average maximum snow height of 16 centimeters (6.3 in). The city's extreme climate sees average highs and lows vary by around 50 °C (90 °F) per year. The average temperature in January is −19.8 °C (−3.6 °F) and the average for July is +21.3 °C (70.3 °F). Extremes have ranged from −40 °C (−40 °F) in January 2011 to +36.4 °C (97.5 °F) in June 2010. Primary industries include iron processing, steel milling, Khabarovsk shipyard, Daldizel, machinery, petroleum refining, flour milling, pharmaceutical industry, meat packing and manufacturing of various types of heavy and light machinery. A high-speed international fiber-optic cable connects the city of Khabarovsk with the city of Fuyuan in China. The city is principal railway center and is located along the Trans-Siberian Railway; the rail distance of Khabarovsk railway station from Moscow is 8,523 kilometers (5,296 mi). Khabarovsk is served by the Khabarovsk Novy Airport with international flights to East Asia, Southeast Asia, European Russia, and Central Asia. Road links include the Trans-Siberian Highway (M58 and M60 Highways), and water transport links are provided by the Amur River and Ussuri River. Public transport includes: tram (8 routes); trolleybus (4 routes); bus and fixed-route taxi (marshrutka, approximately 100 routes). A key street in Khabarovsk is the broad Amursky Boulevard with its many shops and a local market. The city's five districts stretch for 45 kilometers (28 mi) along the Amur River. The similar boulevard - Ussuryisky is located between the two main streets Muravyov-Amursky and Lenin street and runs to the city's artificial lakes (Gorodskie Prudi) with the sport complex Platinum Arena. The lakes are famous for their fountains with the light show. The Military History Museum of the Far Eastern Military District is located in the city, the only such museum in the Russian Far East. Recently,[when?] there have been renovations in the city's central part, rebuilding with historical perspective. There is a walking tour from the Lenin Square to Utyos on Amur via Muravyov-Amursky Street, where visitors find traditional Russian cuisine restaurants and shops with souvenirs. There are a number of night clubs and pubs in this area. In Wintertime ice sculptures are on display on the cities squares and parks. Artists come from as far as Harbin in China. Unlike Vladivostok, the city has never been closed to foreigners, despite it being the headquarters of the Far East Military District, and retains its historically international flavor. Once the capital of the Soviet Far East (from 1926 to 1938), since the demise of the Soviet Union, it has experienced an increased Asian presence. It is estimated that over one million Chinese travel to and through Khabarovsk yearly, and foreign investment by Japanese and Korean corporations has grown in recent years. The city has a multi-story shopping mall and about a dozen hotels. Aleksandr Fedosov, the Khabarovsk Krai Minister of Culture, estimates that the city became more attractive to tourists following the 2015 Bandy World Championship. Khabarovsk is the closest major city to Birobidzhan, which is the administrative center of the Jewish Autonomous Oblast, Russia, located on the Trans-Siberian Railway, close to the border with China. The Jewish Autonomous Oblast is a federal subject of Russia in the Russian Far East, bordering Khabarovsk Krai and Amur Oblast in Russia and Heilongjiang province in China. Its administrative center is the town of Birobidzhan, and it is the only region in the world in that Yiddish is the official language. Khabarovsk provides the closest major airport to Birobidzhan, which is Khabarovsk Novy Airport (KHV / UHHH), 198 km from the center of Birobidzhan. The headquarters of the Russian Eastern Military District is located at 15 Serysheva Street. There is also an air base located 3 km (1.9 mi) to the east of the city. Amur Khabarovsk, a professional ice hockey club of the international Kontinental Hockey League and plays its home games at the Platinum Arena. It used to be the easternmost-based team in the league until Admiral Vladivostok joined the KHL in 2013 as an expansion team. FC SKA-Khabarovsk, a professional association football team playing in the Russian Premier League, the top tier of Russian association football. SKA-Neftyanik, a professional bandy club which plays in the top-tier Russian Bandy Super League at its own indoor venue Arena Yerofey. It is both the easternmost and southernmost team in the top division. In the 2016-17 season the club became Russian champion for the first time and defended the title the following season. The city was a host to the 1981 Bandy World Championship. It also hosted the 2015 Bandy World Championship, which was visited by Prime Minister Dmitry Medvedev. 21 teams were expected, which would have been 4 more than the then record-making 17 (now it's 18) from the 2014 tournament. In the end, China was the only newcomer, while Canada and Ukraine withdrew, the latter for political reasons. Khabarovsk will organise the 2018 tournament as well, but not Division B this time around, which will be held in Chinese Harbin. The event has been named by the Federal Agency for Tourism as one of the best 200 events of the year. A delegation from the 2022 Winter Olympics organising committee will visit Khabarovsk to watch matches in the bandy league, since they are considering letting bandy be a part of the programme in 2022. Khabarovsk placed first in different categories of "Most Developed and Comfortable City of Russia" in 2006, 2008 and 2009. In 2010, Khabarovsk won the second place in the Forbes list of most suitable cities for private business in Russia. First place went to Krasnodar. ^ a b c Энциклопедия Города России. Moscow: Большая Российская Энциклопедия. 2003. p. 503. ISBN 5-7107-7399-9. ^ Государственный комитет Российской Федерации по статистике. Комитет Российской Федерации по стандартизации, метрологии и сертификации. №ОК 019-95 1 января 1997 г. «Общероссийский классификатор объектов административно-территориального деления. Код 08 401», в ред. изменения №278/2015 от 1 января 2016 г.. (State Statistics Committee of the Russian Federation. Committee of the Russian Federation on Standardization, Metrology, and Certification. #OK 019-95 January 1, 1997 Russian Classification of Objects of Administrative Division (OKATO). Code 08 401, as amended by the Amendment #278/2015 of January 1, 2016. ). ^ a b Yanks in Siberia: U.S. Navy Weather Stations in Soviet East Asia, 1945, G. Patrick March, Pacific Historical Review, Vol. 57, No. 3 (Aug., 1988), pp. 327-342, Published by: University of California Press. ^ Государственный комитет Российской Федерации по статистике. Комитет Российской Федерации по стандартизации, метрологии и сертификации. №ОК 019-95 1 января 1997 г. «Общероссийский классификатор объектов административно-территориального деления. Код 08 255», в ред. изменения №278/2015 от 1 января 2016 г.. (State Statistics Committee of the Russian Federation. Committee of the Russian Federation on Standardization, Metrology, and Certification. #OK 019-95 January 1, 1997 Russian Classification of Objects of Administrative Division (OKATO). Code 08 255, as amended by the Amendment #278/2015 of January 1, 2016. ). ^ a b c "Pogoda.ru.net" (in Russian). Retrieved November 30, 2015. ^ "Habarovsk/Novy (Khabarovsk) Climate Normals 1961–1990". National Oceanic and Atmospheric Administration. Retrieved November 30, 2015. ^ Kokurin, Boris (25 February 2014). "Военный музей в Хабаровске готовится к открытию". Komsomolskaya Pravda. Retrieved 1 November 2017. ^ a b World Championship in Khabarovsk - "The National Event of the Year"
^ "В Москве наградили призеров Всероссийского конкурса "Самый благоустроенный город России" — Российская газета — Сегодня в Москве на ВВЦ прошла церемония награждения призеров Всероссийского конкурса на звание "Самый благоустроенный город России" за 2006 год". Rg.ru. Retrieved 2013-03-26. ^ "Хабаровск вновь признан самым благоустроенным городом России — Нина Доронина — Российская газета — Хабаровск вновь признан самым благоустроенным городом России". Rg.ru. 2012-06-21. Retrieved 2013-03-26. ^ "Хабаровск занял II место в рейтинге Forbes - Новости". Hbr.moigorod.ru. Archived from the original on August 17, 2011. Retrieved March 26, 2013. Хабаровская городская Дума. Решение №856 от 28 января 2014 г. «О гимне городского округа "Город Хабаровск"». Вступил в силу 28 января 2014 г. Опубликован: "Сборник нормативных актов администрации города Хабаровска и Хабаровской городской Думы", №1, январь 2014 г. (Khabarovsk City Duma. Decision #856 of January 28, 2014 On the Anthem of the Urban Okrug of "the City of Khabarovsk". Effective as of January 28, 2014.). Хабаровская городская Дума. Решение №509 от 13 июля 2004 г. «Устав городского округа "Город Хабаровск"», в ред. Решения №167 от 22 сентября 2015 г. «О внесении изменений и дополнений в Устав городского округа "Город Хабаровск"». Вступил в силу 8 октября 2004 г. (за исключением отдельных положений). Опубликован: "Хабаровские вести", №152, 8 октября 2004 г. (Khabarovsk City Duma. Decision #509 of July 13, 2004 Charter of the Urban Okrug of "the City of Khabarovsk", as amended by the Decision #167 of September 22, 2015 On Amending and Supplementing the Charter of the Urban Okrug of "the City of Khabarovsk". Effective as of October 8, 2004 (with the exception of several clauses).). Законодательная Дума Хабаровского края. Закон №109 от 28 марта 2007 г. «Об административно-территориальном устройстве Хабаровского края», в ред. Закона №155 от 23 декабря 2015 г. «О внесении изменений в отдельные законодательные акты Хабаровского края». Вступил в силу через 10 дней после официального опубликования (28 апреля 2007 г.). Опубликован: "Приамурские ведомости", №52, 17 апреля 2007 г. (Legislative Duma of Khabarovsk Krai. Law #109 of March 28, 2007 On the Administrative-Territorial Structure of Khabarovsk Krai, as amended by the Law #155 of December 23, 2015 On Amending Various Legislative Acts of Khabarovsk Krai. Effective as of after 10 days from the official publication day (April 28, 2007).). Правительство Хабаровского края. Постановление №143-пр от 18 июля 2007 г. «Об утверждении реестра административно-территориальных и территориальных единиц Хабаровского края», в ред. Постановления №273-пр от 28 августа 2015 г. «О внесении изменений в Постановление Правительства Хабаровского края от 18 июля 2007 г. №143-пр "Об утверждении реестра административно-территориальных и территориальных единиц Хабаровского края"». Вступил в силу 13 августа 2007 г. Опубликован: "Собрание законодательства Хабаровского края", №7(60), 12 августа 2007 г. (Government of Khabarovsk Krai. Resolution #143-pr of July 18, 2007 On the Adoption of the Registry of the Administrative-Territorial and Territorial Units of Khabarovsk Krai, as amended by the Resolution #273-pr of August 28, 2015 On Amending the Resolution #143-pr of the Government of Khabarovsk Krai of July 18, 2007 "On the Adoption of the Registry of the Administrative-Territorial and Territorial Units of Khabarovsk Krai". Effective as of August 13, 2007.). Законодательная Дума Хабаровского края. Закон №177 от 28 апреля 2004 г. «О наделении муниципального образования города Хабаровска статусом городского округа и об установлении его границы». Вступил в силу со дня официального опубликования (28 мая 2004 г.). Опубликован: "Приамурские ведомости", №95, 28 мая 2004 г. (Legislative Duma of Khabarovsk Krai. Law #177 of April 28, 2004 On Granting Urban Okrug Status to the Municipal Formation of the City of Khabarovsk and on Establishing Its Border. Effective as of the day of the official publication (May 28, 2004).). Законодательная Дума Хабаровского края. Закон №264 от 14 марта 2005 г «Об административных центрах сельских поселений и муниципальных районов Хабаровского края», в ред. Закона №239 от 28 ноября 2012 г. «О преобразовании городского населённого пункта рабочий посёлок Тырма, находящегося на территории Верхнебуреинского района Хабаровского края, путём изменения его статуса в сельский населённый пункт — посёлок Тырма и о внесении изменений в отдельные Законы Хабаровского края». Вступил в силу со дня официального опубликования. Опубликован: "Приамурские ведомости", №57, 1 апреля 2005 г. (Legislative Duma of Khabarovsk Krai. Law #264 of March 14, 2005 On the Administrative Centers of the Rural Settlements and the Municipal Districts of Khabarovsk Krai, as amended by the Law #239 of November 28, 2012 On the Transformation of the Urban Locality the Work Settlement of Tyrma, Located on the Territory of Verkhnebureinsky District of Khabarovsk Krai, by Changing Its Status to That of a Rural Locality—the Settlement of Tyrma, and on Amending Various Laws of Khabarovsk Krai. Effective as of the day of the official publication.). Wikimedia Commons has media related to Khabarovsk. Wikivoyage has a travel guide for Khabarovsk. Look up Khabarovsk in Wiktionary, the free dictionary. This page was last edited on 16 April 2019, at 03:57 (UTC).